Summer has officially arrived in Hamilton County, Indiana! It&apos;s the perfect time to wade into the water or check out a farmers market to see what produce is in season. Read on for Memorial Day Weekend events and check out the Visit Hamilton County online calendar for even more. Be sure to check out our online calendar for even more Hamilton County happenings. ‘Tis the season for pools to open! Check out the River Crossing water play area at Conner Prairie or The Waterpark at the Monon Community Center in Carmel. Or head to the Aqua Adventure Park at Morse Park and Beach, complete with slides and obstacle courses. 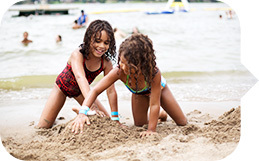 Relax on the beach and build sandcastles at Saxony Lake & Beach. This is the kick off the summer concert series with some local student talent. 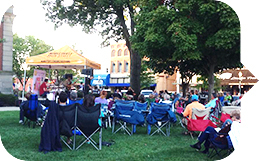 Students from Noblesville High School will present the most unique final exam you&apos;ll ever find, a concert for the community on the courthouse square. 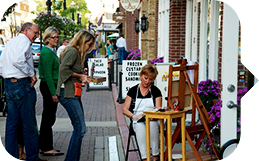 Carmel Arts and Design District welcomes plein air artists to paint the district. Join other artists and have fun creating art as often as you choose - paint 1 hour... 1 day... both days! 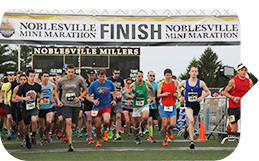 This scenic event offers runners and walkers a tour of beautiful Noblesville and showcases the area&apos;s most beloved attractions such as the Courthouse Square, Forest Park, Morse Beach, and Potter&apos;s Bridge. 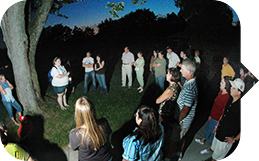 Take a walking tour filled with stories of ghosts of the historic Underground Railroad mixed with modern-day gangsters and spirits from Westfield&apos;s haunted history.